Sega has decided that enough is enough and has delved back into the hardware market. Though those expecting the next MegaDrive will be disappointed, as it's nothing more than a bog-standard PMP, the Sega Vision. Most of you will remember the days when Sega was the great lord of gaming, with the DreamCast set to herald in a new era of gaming fun. 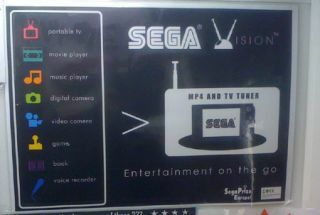 But the new Vision seems to be a Chinese electronics manufacturer taking the Sega name and popping it on a device that can play MP4, some form of games, and TV via the built-in tuner. In fairness, it can also take photos and video, record your voice and let you read e-books, but not a lot of people do that on dedicated e-book readers yet, so it's unlikely they'll bother on a PMP. The Register Hardware is reporting Sega as saying the device will be coming to the UK early next year, so start getting excited now. The same site also shows a pic of the device in a London gaming centre... so start scouring the arcades now if you can't wait until 2009.